After reviewing the Fire Truck Toy Car I was extremely excited that Picasso Tiles asked me to review Picasso Tiles PTT 301 Front Loader Tractor! Similar to the Fire Truck, but it is a tractor. Just for ya’ll to know, I am not getting paid to do these reviews. I truly enjoy Picasso Tiles and the toys they put on the market. I would buy these if I wasn’t asked to review the products they choose to send. These reviews are my 100% honest opinion. In here I might link different products through my affiliate amazon link. When I first opened the package I noticed the box was smaller, meaning the truck would be smaller. However, I am not one to judge a toy by its size. As with the Fire Truck, it is high quality. There are multiple parts to screw off and on which benefits fine motor and creativity skills. The screwdriver has three different tops, a Phillips, a flat-head, and one that fits over the top (I’m not sure if it has an actual name). The children preferred the latter as it was easier to use. Added bonus of this screwdriver: It clicks when it is tight! I love that feature of this truck! Since we live in a small, farming town I was very excited to show the kiddos the tractor. All of the kids love to play with it! Even if we aren’t taking it apart! Its multiple use is one reason I love it! STEM: Science, Technology, Engineering, and Mathematics. Curiosity: I love toys that promote children’s thinking and understanding. The screwdriver clicks when it is tightened. Fine Motor Skills: screwing on the screws takes concentration and finger muscles. Gross Motor Skills: Some kids will crawls around while pushing it. As with the Fire Truck, my only con would be the size of the screws plus the screwdriver and tools. I do recommend buying Picasso Tiles PTT 301 Front Loader Tractor! Or others from Picasso Tiles! They have wonderful toys that are open-ended to promote curiosity and imagination! You can buy the tractor here from my affiliate amazon link. Or here, directly from Picasso Tiles site. There are many ways for children to learn through play. My favorite way to see them learning through play is child-led play. Child-led play is just as is sounds: play that is child-led. That doesn’t mean that children run the show, but they do have an equal say in everything that goes on. Child-led play is play that is directed by the child. It is play that explores the world and how it works. Child-led play is art created with adult guidance but not done by adults (also known as process art). It is play that is at the child’s level that works at their developmental level. I love child-led play. I feel like I can get to know the kiddos in my group better by using child-led play. Child-led play makes me observe and think about what the children are doing. It takes some thoughtful planning to set up the materials in a way that interest the children and keeps them engaged for more than two minutes. Child-led play also allows children to really interact and play with each other. They are able to work on communication skills, problem solving skills, and their imagination. All of which I think are very important and beneficial as children grow! I try to incorporate child-led play into every part of our day. The morning is our prime-focus time as we have kiddos who get picked up from 2-5. After breakfast we have an activity. 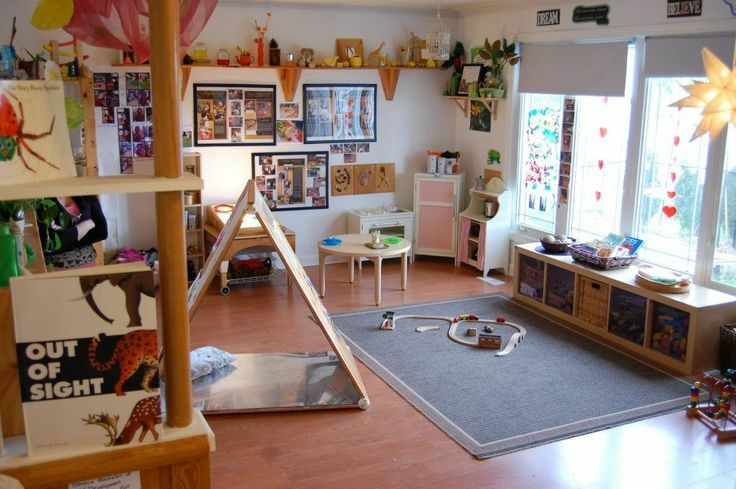 That activity can be a specific group of toys out, sensory bins, coloring, or puzzles. I base it off of what I am feeling as well as what the children request. Some days I don’t want to sweep up piles of sand from our sensory bins. Even though I remind them we keep the sand in the bin, it always makes its way onto the table…and chairs…and floor. I try not to repeat activities during the week, but bring them back out in later weeks if the children were really engaged. I will also add or remove something if an activity didn’t work. Sometimes the children will request an activity that we have done earlier in the week that we will take out for the second time that week. When that does happen, I add different materials so that it seems like a new activity. I do this so the children are more engaged while they play instead of getting bored of the same activity every day. I find that switching up the morning activity encourages and increases engaged play and learning. With child-led play, adults should be in the passenger seat, along for the ride. Children aren’t given the drivers seat that often. Child-led play gives them the wheel to learn and play with what they want. When I introduce the play to the children, I let them decide where to take it. At times I will sit back and observe them playing. When I observe their play I look at commonalities between the children. How many are really into transferring materials between cups, building high or building wide, and creating characters out of the materials. How they interact with the materials is a window into their mind, how it works, and where they are developmentally. I also will play with them. Like I said before, I’m just the passenger. I follow the children in their play. If we’re playing with play-doh and dinosaurs and they turn the play-doh in beds, I’ll do the same. What I do add to the play is my self-talk. I talk through what I am doing with them. “Oh, my dinosaur is so sleepy! He wants to lay down! My orange dinosaur is going to tuck him in. Good night dinosaur!” More often than not, the children do what I do. As that starts to happen I let the children really develop their play after my addition. I will ask them what they are building or doing with the material. If they seem stuck I’ll give a suggestion. If we were building with toys and it kept falling over I would ask, “What if we make the bottom bigger?” Usually they say no becasue then they won’t have all of the materials to build it high. I know how science works, but children don’t and this is the best time for them to be exploring how everything works. They don’t have to take my suggestions, I don’t force them to. As I said in the beginning, the children lead the play. This type of play is specific for children. I don’t do it as “traditional” as some would, but I do allow the children to have the control while playing. I just set the materials out for them, which is based off Reggio Explorations. I’ll talk about that in another post. Even though I set out the materials in the morning for the children to use, they still are able to decide how they are used. With our free play, that play is 100% child-led. They choose what toys to play with, when they play with them, for how long, and who they play with. During our morning activities I set up materials such as play-doh and cookie cutters, knives, and bowls. After I set it up, I let the children take control. If they ask for another toy to enhance their play, I let them. There’s no need to say “no” to every request. That’s limiting their play, which isn’t the point of child-led play.